Deciduous tree, 10-30 m tall; bark white, yellowish- to reddish-brown or dark grey, often peeling; twigs hairy with both short and long hairs. 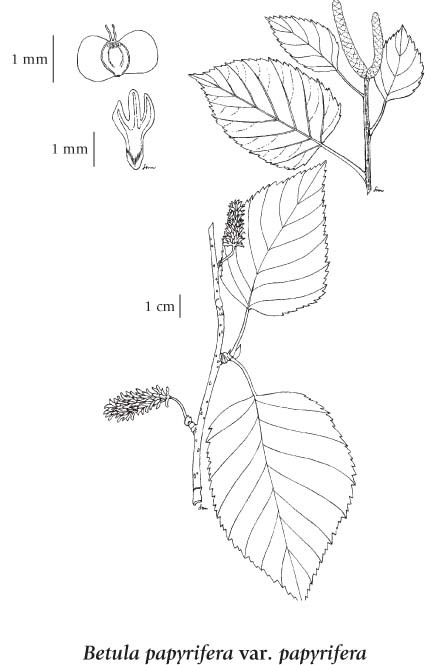 Alternate, deciduous, broadly egg-shaped in outline, the tips sharp-pointed, hairy below, rarely glandular, 4-10 cm long, leaf stalks more than 1 cm long. Male and female flowers in separate catkins 2-4 cm long; flowers emerging before or with the leaves; catkins breaking up at maturity. Nutlets with broad wings, at least twice as wide as the body of the nutlets; bracts with rounded, ascending or diverging lateral lobes. 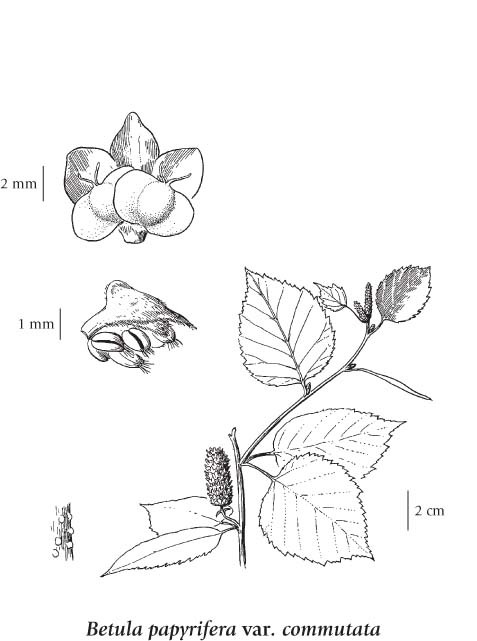 Numerous apparent hybrids between B. papyrifera and B. neoalaskana or B. occidentalis (e.g., B. x utahensis Britt. and B. subcordata Rydb.) have been formally named (see Brayshaw 1996b, Scoggan 1979). Two varieties occur in BC. 1. Mature bark white, yellowish- to reddish-brown or dark grey; fruiting bracts with lateral lobes diverging at right angles................... var. commutata (Regel) Fern. Moist to mesic woodlands, forests, clearcuts, burns and open areas in the lowland, steppe and montane zones; var. commutata - frequent in extreme SW BC, var. papyrifera - common throughout BC east of the Coast-Cascade Mountains; N to AK, YT and NT, E to NF, and S to MN, PA, CO and NE OR.